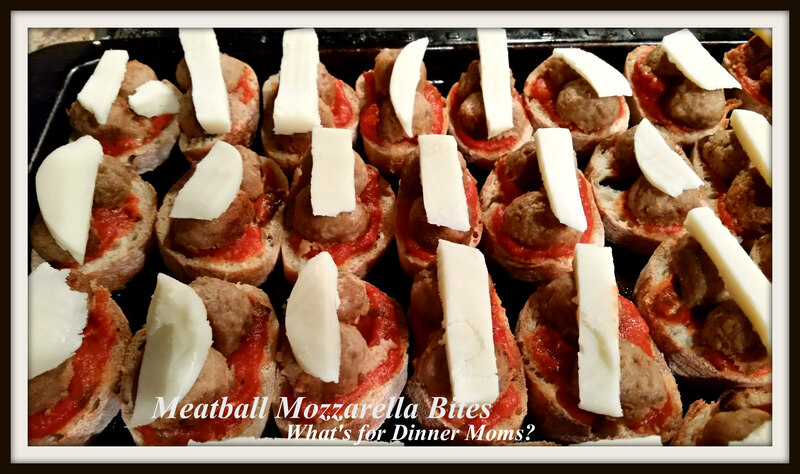 Meatball Mozzarella Bites – What's for Dinner Moms? This time of year having a few easy appetizer recipes in the back of your mind can be a good thing. Whether it is a house full of teenagers, someone dropping by near dinner time unexpectedly or those last-minute party invitations having the makings for easy appetizers is always a good idea. These are hearty bite and would also be great for a Super Bowl party or a teen sleepover. 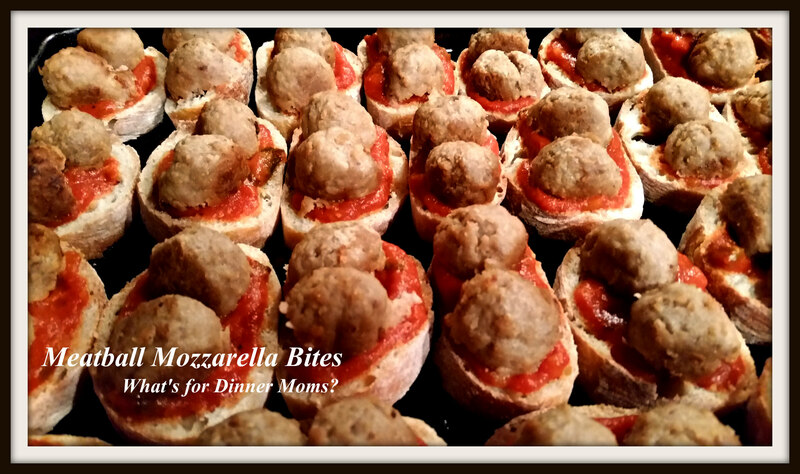 These were yummy and so easy to make! 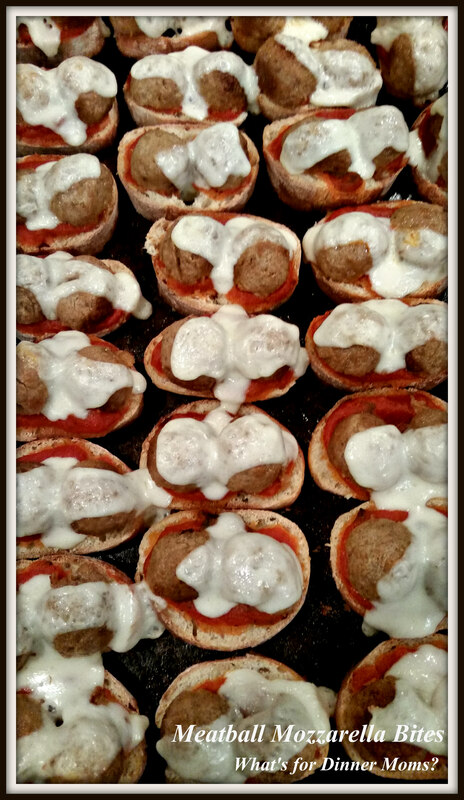 Within 30 minutes they were on the table and if you have your meatballs cooked ahead of time and stored in the refrigerator it would be 10 minutes! Line a rimmed baking sheet with the baguette slices. Place them close together. I was able to fit about 40 on my pan. Spoon 1 tablespoon, or so, of spaghetti sauce on each baguette slice. Spread close to the edges but not over the edges or the bread will burn. Add 2 pieces of meatball onto the bread. Cover with a slice of mozzarella cheese. Sprinkle with garlic powder and or Parmesan cheese if desired. Bake dish for 7-10 minutes until cheese has melted and bread is browning at edges. If you wish turn the broiler on for 1 minute or so to brown the tops. Watch the pan carefully as they will go from brown to black in just a few moments! Remove pan from oven and cool slightly before serving. This is saved in my bookmarks to make one day soon! Yeah! Hope you like it! Pingback: Six Big Game Day Crowd Favorites! | What's for Dinner Moms? These just went on my meal plan! It’ll be like a party on a weeknight! These just went on my meal plan for one of our family dinners! I’ll serve salad and we’ll all feel like it’s a party!